Train tracks and highways are wonderful things. They zip ourselves and our stuff around with unparalleled efficiency. Never has getting anywhere been so easy. They are true marvels of the modern age—unless you can’t use them. Train tracks without nearby stations or those that don’t serve passengers aren’t conveniences, they’re rumbling menaces. And highways without onramps close at hand are roaring headaches. No one wants to live next to them. 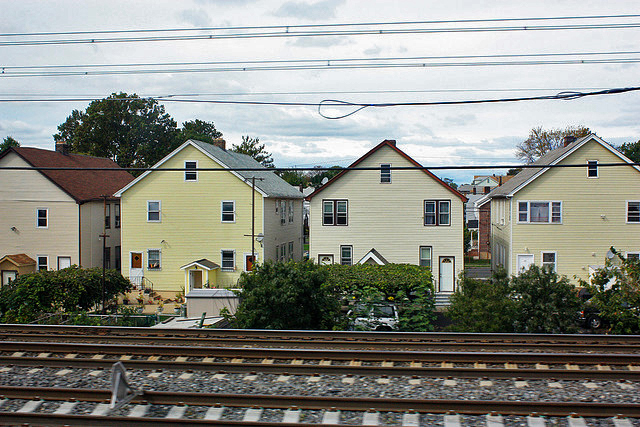 When transit corridors are nuisances rather than amenities, home prices suffer. There are a couple of ways to measure how big of a bite nearby-but-inaccessible transit corridors take out of housing prices. One of the simplest is to look at freight trains. Freight trains offer few tangible benefits to the general public, but they present a lot of downsides. Their diesel engines emit low growls, their whistles high pitched wails. Their burdened cars rumble through neighborhoods, shaking doors and windows as they pass. A study conducted in the late 1970s in London, Ontario, found that house prices started dropping off within 800 feet of the tracks. The closer the house, the greater the loss in value. Another way is to look at freeways without nearby onramps. A study of the Interstate 90 corridor running east from downtown Seattle found that house prices near to the freeway but far from an onramp suffered. A second part of the study focused on the Mt. Baker neighborhood in Seattle, part of which overlies a tunnel for I-90. People who live in Mt. Baker do not have easy access to the freeway, but they also do not suffer from noise or air pollution because of the tunnel. Yet houses dropped in price anyway the closer they were to the tunnel, a fact the study’s authors attributed to stigma of living near a freeway. Houses situated on top of the tunnel were worth 20 percent less than those 300 feet away. Then there’s the question of commuter or light rail. There are dozens of studies that show living close to a train station increases house prices, but there is such a thing as too close. Apartments in Haifa, Israel, that were within 50 to 100 meters (about 160 to 330 feet) of train tracks sold for 13 percent less than houses outside that buffer. Immediately outside that distance, prices shot up and then tapered off slowly, as those residences were conveniently close to the stations but far enough away from the noise. One hundred meters is not the universally optimal distance from train tracks, though. Lines with less frequent service may not sufficiently offset the downsides of living next to tracks, and those that run at-grade (as opposed to underground) may drive prices south. For example, houses adjacent to tracks for CalTrain, which offers commuter service to the San Francisco Peninsula, sold for substantially less than houses next to tracks for BART, the light rail system for much of the rest of the Bay Area. The diesel CalTrain runs at-grade and offers less frequent service than the electric BART, large portions of which run underground. Train tracks and freeways can be a nuisance, and each in their own way. Trains are generally quieter than freeways, but infrequent train passings and whistles at crossings can make them more noticeable. On the other hand, trains produce less pollution than freeways, which have proven negative effects on respiratory health. Living with neither set of problems would be ideal, but modern means of travel are not going away.